← Gung Ho Fat Boy! January can be a depressing month…but my creative friend, super talented painter, illustrator & chalkboard artist, Victoria Heryet would have none of that! 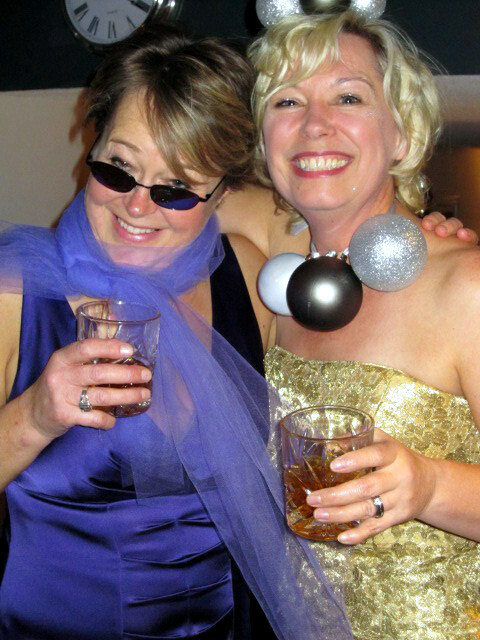 She decided to throw a “Lifting Spirits Party”, with a twist; requesting guests come dressed as a cocktail. I was expecting to see loads of Pink Ladies at the soiree, but guests rose to the occasion and I found myself among a bevy of favourites; White Russian, Black Russian, Beautiful, Rusty Nail, Red Bull & Vodka (that guy was hyper…just sayin’), Jack Daniel’s was there (yeah sure, a little name dropping), as were lots of Mai Tai’s, brewskis, w(h)iners, martinis and 1 Pink Lady. The magical hostess went as Purple Haze, while I went as Champagne. Adding to the spirit of Heryet’s party was a delicious cocktail, which was first introduced to Victoria & I at the Loden Hotel’s 3rd Year Anniversary Party. 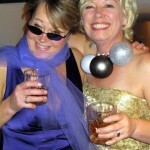 That was a great party too…sure there were some initial flow issues, but a fabulous party nevertheless! Upon arriving at the beautiful boutique hotel we were granted special ‘passports’ by vivacious, happy women and instructed to enjoy our journey traveling through the many themed party rooms. While each themed room featured a signature cocktail, by far, the best drink was in the ‘Gentleman’s Room’ …no, not what you’re thinking! It was a room decorated in a manly fashion offering poker and professional barber grooming (straight razor style -yikes!). This room’s feature drink was a lovely and robust, masculine concoction made with a bourbon base. They referred to it as an “1181″, but we must admit we found the name didn’t convey the a wonderfulness of this elixir quite enough. For her Lifting Spirits Party, Victoria made a BIG pitcher and rightfully dubbed it The Blues Chaser! 1/3 oz. B&B (on a budget?…Angostura Bitters will do in a pinch). Shake all ingredients together over ice. Pour into highball glass filled with ice. Enjoy! And chase your blues away. All items (except tea) available at Legacy Liquor Store (quite possibly the best liquor store ever!). This entry was posted in Cocktails and tagged 1181, Angostura Bitters, B&B. Benedictine, Blues Chaser, bourbon, cocktail, Legacy Liquor, Legacy Liquor Store, loden Hotel, Makers Mark, party, Purple Haze, Spirits, The Blues chaser, Tuaca, Vanilla Rooibos Tea, Victoria Heryet. Bookmark the permalink.